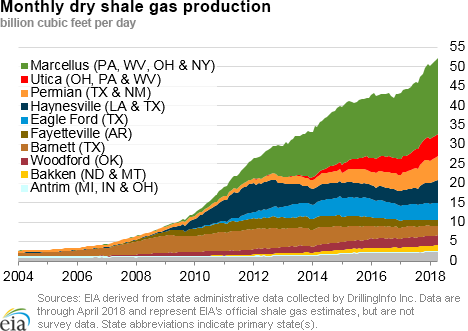 In April 2018, natural gas production from the Utica formation, located primarily in Ohio, averaged 5.8 billion cubic feet per day (Bcf/d), or about 7% of total U.S. dry natural gas production. Utica natural gas production has increased relatively steadily since 2011, and in 2017, natural gas production from the Utica formation reached a new annual high of 4.9 Bcf/d, 23% higher than 2016 levels. Despite steadily increasing production, Utica’s rig count and prices in the region have fluctuated. 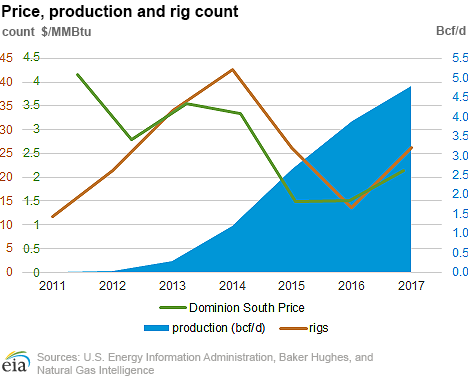 From 2011–14, as Dominion South and other nearby hub prices remained higher than $2.75 per million British thermal units (MMBtu), the average yearly rig count kept rising, reaching an average of 43 rigs in 2014. 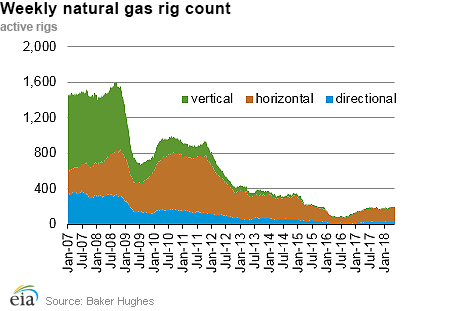 However, by 2016, the rig count fell to 14 rigs, and prices declined to $1.50/MMBtu. New pipeline projects added takeaway capacityfrom the region in 2017 and both rigs and prices rose, though they remain lower than previous levels. 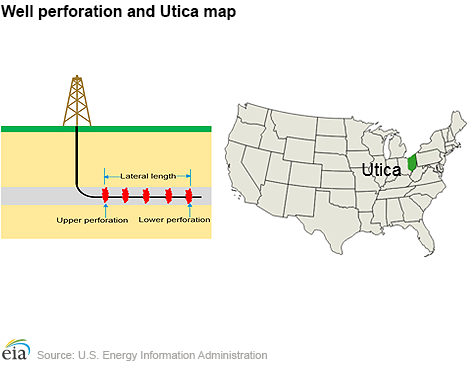 Utica’s natural gas production increase has been supported by higher per-well production from new wells. Similar to production activity in other regions, such as the Marcellus and the Haynesville, drilling operators have increased the lateral length of horizontal wells. From 2011 to 2017, the average length of laterals increased from 4,649 feet to 8,628 feet, according to DrillingInfo. As production has grown, well productivity has also risen. EIA uses three-month cumulative production as a proxy for initial productivity (IP) rates because the number of days in production for any given month is not available. In Utica, the first three-month cumulative production per well increased from about 146 million cubic feet (MMcf) in 2011 to 824 MMcf in 2017. 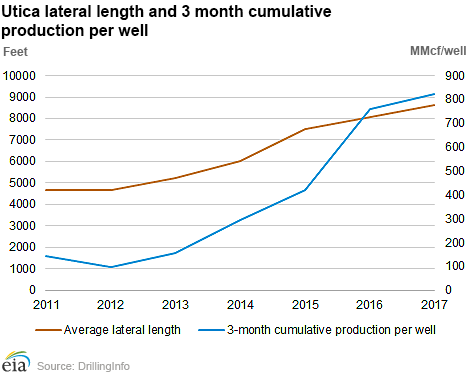 Moving forward, productivity gains are expected to continue as lateral lengths increase and optimization of spacing between wells improves well recovery. Natural gas spot prices rose at most locations this report week (Wednesday, May 16 to Wednesday, May 23). The Henry Hub spot price rose from $2.78/MMBtu last Wednesday to $2.86/MMBtu yesterday. At the New York Mercantile Exchange (Nymex), the June 2018 contract price rose 10¢ from $2.815/MMBtu last Wednesday to $2.914/MMBtu yesterday. Net injections to working gas totaled 91 billion cubic feet (Bcf) for the week ending May 18. Working natural gas stocks are 1,629 Bcf, which is 33% lower than the year-ago level and 23% lower than the five-year (2013–17) average for this week. 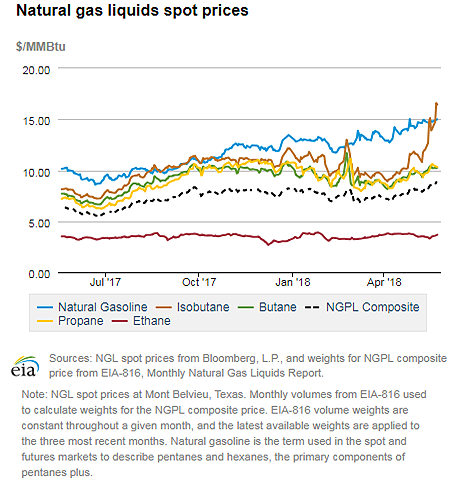 The natural gas plant liquids composite price at Mont Belvieu, Texas, rose by 45¢, averaging $8.69/MMBtu for the week ending May 23. The price of natural gasoline, ethane, propane, butane, and isobutane rose, by 1%, 5%, 6%, 2%, and 14%, respectively. According to Baker Hughes, for the week ending Tuesday, May 15, the natural gas rig count increased by 1 to 200. The number of oil-directed rigs remained constant at 844. The total rig count increased by 1, and it now stands at 1,046, the highest level since March 2015. Prices rise across the Lower 48 states. Prices rose across the country this report week (Wednesday, May 16 to Wednesday, May 23) as temperatures generally increased and higher cooling demand increased natural gas use for electricity generation toward the end of the report week. The Henry Hub spot price rose 8¢ from $2.78/MMBtu last Wednesday to $2.86/MMBtu yesterday. At the Chicago Citygate, prices increased 26¢ from $2.48/MMBtu last Wednesday to $2.74/MMBtu yesterday. Prices at PG&E Citygate in Northern California rose 14¢, up from $2.90/MMBtu last Wednesday to $3.04/MMBtu yesterday, with a low of $2.86/MMBtu on Thursday. The price at SoCal Citygate was volatile throughout the week, but overall it decreased 57¢ from $3.03/MMBtu last Wednesday to $2.46/MMBtu yesterday. Northeast prices rise during shoulder season pipeline maintenance. Prices at Northeast market hubs increased to varying degrees over the report week as maintenance activity restricted flows on several pipelines. At the Algonquin Citygate, which serves Boston-area consumers, prices were mostly flat, rising 3¢ from $2.40/MMBtu last Wednesday to $2.43/MMBtu yesterday. At the Transcontinental Pipeline Zone 6 trading point for New York City, prices were volatile as ongoing maintenance on the Millennium pipeline affected flows, and overall prices increased 55¢ from $2.32/MMBtu last Wednesday to $2.87/MMBtu yesterday. Tennessee Zone 4 Marcellus spot prices increased 40¢ from $0.77/MMBtu last Wednesday to $1.17/MMBtu yesterday, with a high of $1.27/MMBtu on Monday. Prices at Dominion South in northwest Pennsylvania rose 4¢ from $2.19/MMBtu last Wednesday to $2.23/MMBtu yesterday. Price increases accompanied maintenance-related flow restrictions on the Millennium, Columbia Gas Transmission, and Texas Eastern Transmission pipeline systems. Nymex prices rise. 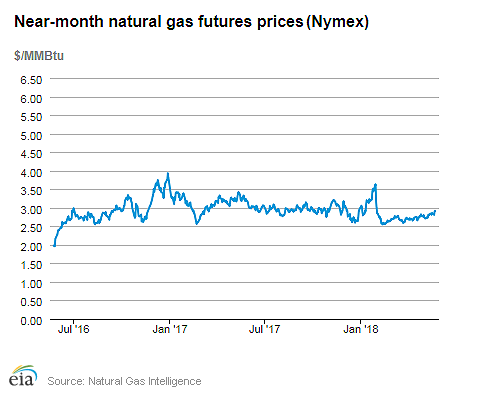 At the Nymex, the price of the June 2018 contract increased 10¢, from $2.815/MMBtu last Wednesday to $2.914/MMBtu yesterday, the highest front-month price since January. The price of the 12-month strip averaging June 2018 through May 2019 futures contracts climbed 11¢ to $2.955/MMBtu. Supply rises. According to data from PointLogic Energy, the average total supply of natural gas rose by 1% compared with the previous report week. Dry natural gas production remained constant week over week, and average net imports from Canada increased by 3%. Demand falls. 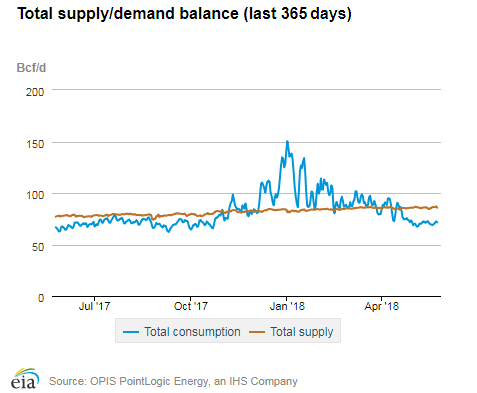 According to data from PointLogic Energy, total U.S. consumption of natural gas fell by 1% compared with the previous report week. Natural gas consumed for power generation declined by 3% week over week. This overall decrease came despite an increase in cooling demand late in the report week, which affected spot prices. Industrial sector consumption stayed constant, averaging 19.9 Bcf/d. In the residential and commercial sectors, consumption declined by 1%. Natural gas exports to Mexico decreased 1%. The Federal Energy Regulatory Commission (FERC) released its Summer 2018 Energy Market and Reliability Assessment last Thursday. This assessment forecasts adequate electricity resource availability throughout the summer in most regions, with the notable exception of Southern California. It also raised the possibility of record-high levels of natural gas use for power generation. U.S. liquefied natural gas (LNG) exports decrease week over week. Five LNG vessels (combined LNG-carrying capacity 18.8 Bcf) departed the United States from May 17 to May 23 (four tankers from Sabine Pass liquefaction terminal and one tanker from Cove Point). Cheniere Energy announced Tuesday that it had made a positive final investment decision on the third train for its Corpus Christi LNG export terminal in Corpus Christi, Texas. The first two trains are already under construction; this third train will bring the nameplate capacity of the Corpus Christi terminal to about 13.5 million metric tons per year, the equivalent of about 2.1 Bcf/d. Net injections top the 5-year average for the third week in a row. Net injections into storage totaled 91 Bcf for the week ending May 18, compared with the five-year (2013–17) average net injections of 89 Bcf and last year's net injections of 74 Bcf during the same week. Net injections during the week averaged 13.2 Bcf/day; net injections will have to average 13.1 Bcf/day for the remainder of the refill season to match the five-year average level (3,815 Bcf) by October 31. Working gas stocks totaled 1,629 Bcf, which is 499 Bcf lower than the five-year average and 804 Bcf lower than last year at this time. The deficit to the five-year average peaked at 534 Bcf earlier this year during the week ending April 20. Despite low storage inventories, the average January 2019 futures contract price trades at a smaller premium to the average spot price than last year at this time. 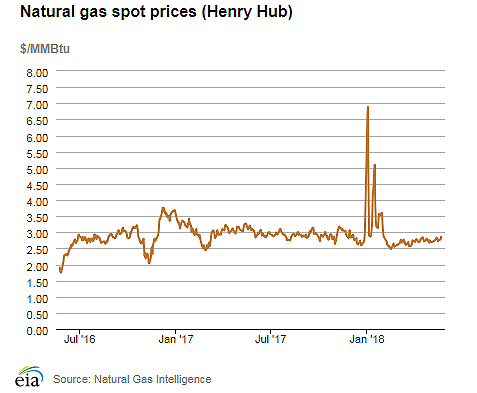 During the most recent storage week, the average natural gas spot price at the Henry Hub averaged $2.78/MMBtu while the Nymex futures price of natural gas for delivery in January 2019 averaged $3.07/MMBtu, 29¢/MMBtu higher than the spot price. A year ago, the January contract was 44¢/MMBtu higher than the spot price. Reported net injections into storage are close to the median of analysts’ expections. According to the Desk survey of natural gas analysts, estimates of the weekly net change from working natural gas storage ranged from net injections of 83 Bcf to 100 Bcf, with a median estimate of 92 Bcf. At the 10:30 a.m. release of the Weekly Natural Gas Storage Report (WNGSR), only 2 trades were executed, with the Nymex price for June delivery remaining unchanged at $2.91/MMBtu. Several seconds after the release, trading activity increased, with prices climbing to $2.92 /MMBtu. Temperatures are in the normal range for the storage week. Temperatures in the Lower 48 states averaged 63 degrees Fahrenheit (°F), 1°F higher than the normal and the same as last year at this time.